It seems only fitting that an anthology such as Interfictions 2: An Anthology of Interstitial Writing has an online supplement over at the IAF Annex. And yet the title is also apropos: this isn't a true collection of interstitial writing in the sense that it only focuses on fiction, as opposed to an anthology that includes comics, art, and other mediums. But as far as stories go, this book does skirt the boundaries and has a unique feel. I'm not really familiar with the term interstitial fiction as I should be but the introduction by Henry Jenkins does a great job of explaining it that it seems like the most creative genre (or non-genre as the case may be). Also noteworthy is the interview with Delia Sherman and Christopher Barzak by Colleen Mondor at the end of the book. If Jenkins's essay is a primer on the interstitial arts, this interview breaks it wide open and posits possibilities, while admitting that interstitial fiction is a product of its time and what we might consider interstitial today might not be the case tomorrow. Which perhaps brings me to this conclusion: I'm really an interstitial reader. 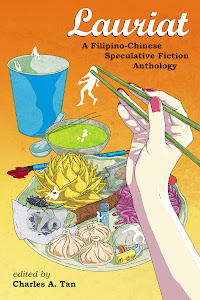 I don't perceive the stories included in this anthology to be interstitial stories as much as stories, period (and perhaps "speculative fiction"). It takes a conscious effort to trace the boundaries (although no doubt, they are there) and how the various fictions included transcend the said borders. Maybe because interstitial fiction is already included in various publications that I read, whether it's literary venues or fantasy or science fiction or -insert genre here-. Having said that, the works featured here have a unique voice and tone, and a lot certainly deviate from what most people would label a conventional story. There's an experimentation in style and technique, and while not all of them are original, there is a visible effort in the attempt (and actually succeeding). There are two stories I want to specifically tackle here because they're undeniable favorites. "The Assimilated Cuban's Guide to Quantum Santeria" by Carlos Hernandez and "Count Poniatowski and the Beautiful Chicken" by Elizabeth Ziemska are brilliant pieces. Now this is actually the first time that I've read Hernandez (or remember doing so), and Ziemska is someone whom I feel is an underappreciated author. Both deliver stories with a lot of emotional resonance, and while they employ fairly standard narrative techniques, both also cross genre lines from fantasy to science fiction to fiction, keeping readers on their toes and making the most out of the tropes of the said genres. The said pieces are so good that I'm perfectly content buying the book and reading just these two. On a less optimistic note, and this could swing in either direction, but at the end of each piece, the authors talk about their story. While this is an insightful read in some cases, adding new layers to the narrative, it sometimes becomes a defensive explanation of why the included fiction is considered interstitial. Here, the author's confidence and motives become transparent, and while it certainly enhances some stories, it can be disappointing in others. Lastly, another strength of this anthology is that it has an agenda behind it. I mean I loved Eclipse Three by Jonathan Strahan, and in a certain sense, some stories published there would fit perfectly here (and vice versa), but one also has to take into consideration the long-term plans of the editor(s). Not that unthemed genre anthologies is a less-worthy cause (and in fact is more important nowadays with the discontinuation of such anthologies), but when it comes to Interfictions 2: An Anthology of Interstitial Writing, there's a definite goal that's transparent to readers. For me, Sherman and Barzak succeed in delivering quality stories that follow their agenda, and this book is testament to what they're trying to accomplish.